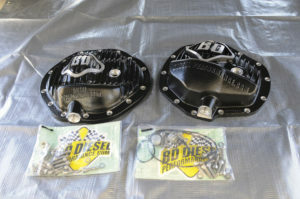 The BD Diesel Performance aluminum alloy differential covers for AAM 11.5″ and 9.25″ axles are more than just good looking! They are designed to sling a steady flow of lubricant over the ring gear to saturate the pinion gear with oil. 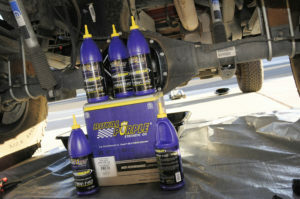 Heavy duty Royal Purple ‘Max Gear’ lubricant runs cooler and works even more effectively with these heavy duty covers. 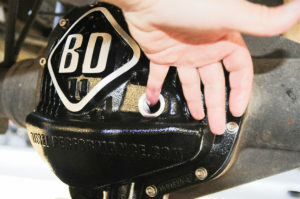 BD Diesel’s performance differential covers are more than eye candy! These aluminum alloy covers increase differential lube capacity, and the finned cooling helps maintain normal fluid temperatures. The covers feature troughs for added lube capacity and a design that captures more lube on the ring gear and carries this lube over the ring gear. 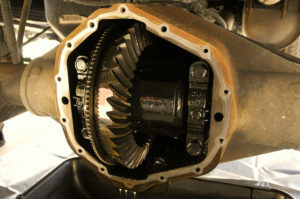 This is far more than cosmetic, the covers reduce temperature, add lube where it is vitally needed and carry more lube to the pinion gear head and bearings. This increased lube flow and saturation of the ring-and-pinion gears is what we need for the Ram 3500 4×4 and trailer hauling. The 4.56:1 aftermarket gears have a smaller pinion tooth count and spin the pinion shaft over 22% faster than the stock 3.73 gearing. Here we drain the traditional 75W-140 Mopar synthetic lube. 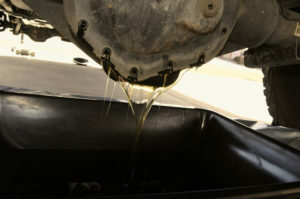 This routinely changed fluid is so clean that we were tempted to filter it through 100-mesh screen and reuse it on our Jeep® XJ Cherokee 4×4 axles. We passed on that idea and poured this oil into the recycling tank. Thorough cleaning gets the axle ready for Royal Purple’s ‘Max Gear’ Lube. 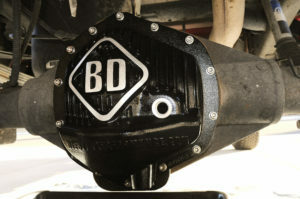 The BD Diesel Performance rear differential cover for Ram and GM 11.5″ axles features a machined O-ring groove. The kit comes with a one-piece O-ring and stainless steel socket head screws and washers. The provided drain plug fits strategically at the lowest point in the axle and has a magnetic core. 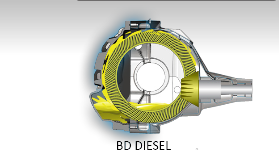 This is optimal for catching harmful metallic debris that would otherwise circulate through the differential, bearings and gears. 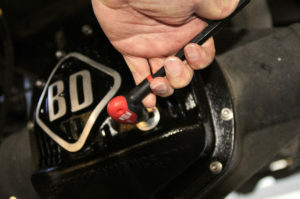 Lube resistant O-ring seals assure an oil-tight seal at these plugs. This is a qualitative improvement over OEM components. This is the gear assembly draining during the cover change. We will wipe out all visible, accessible lube. The use of Royal Purple ‘Max Gear’ lubricant will make this a long-term fluid change. 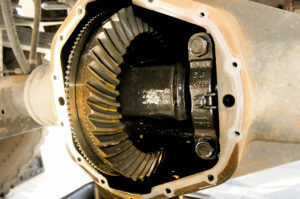 The switch to aftermarket 4.56:1 axle gearing drops the pinion tooth count to 9 teeth. The OEM 3.73 gears had an 11-tooth pinion gear. The pinion shaft and bearings spin faster and benefit from more lubrication, which the BD Diesel Performance differential covers provide. Install the cover carefully to assure that the O-ring remains in place. We tighten the socket head (6mm hex size), 8mm x 1.25 pitch screws in cross, bringing the torque up gradually and in steps. Final torque will be 24 ft. lbs. 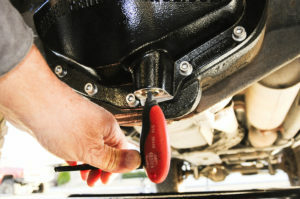 Use of a torque wrench assures accurate, flush fit of the cover. Combined with Royal Purple ‘Max Gear’ lube, this fluid change will last considerably longer than OEM fluids. Clean fluid behind the cover is enhanced by the magnetic plug positioned at the lowest point. Tighten plugs carefully. Though rugged, this cover is aluminum alloy. Tighten securely without over-tightening the plug. The O-ring will assure a leak-free seal. 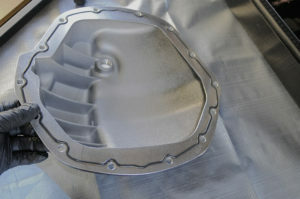 The cover in place on the 11.5″ axle housing, the axle is ready for a lube fill. The cover is attractive and very stout with its thick flange. More importantly, it actually has utility value and a design that assures thorough gear and bearing lubrication. 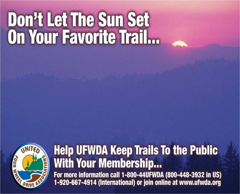 On the road when pulling a trailer in summer heat, these advantages will pay off. For long-term lubrication and superior synthetic lubrication, we turned to Royal Purple. The ‘Max Gear’ 75W-140 lube pours readily like a 75W lube. As the axle warms up in service, the lube will provide protection over the widest range of heat and load possible, equivalent to the performance of a 140W gear lube if the axle gets hot enough*. 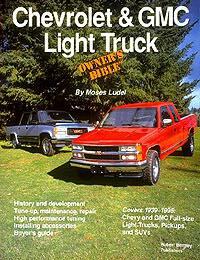 This lubrication has the best formulation for towing and 4×4 challenges, well worth the cost. With 4.56 gears, notorious for increased noise levels and bearing stress, Royal Purple ‘Max Gear’ 75W-140 is our choice! Note: Contrary to misconception, multi-viscosity oils do not “thicken” as they get hotter. 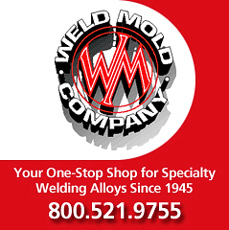 Instead, they offer the same protection as the higher viscosity range oil at these higher temperatures. 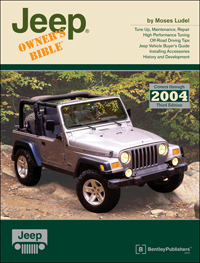 The increased capacity of the cover increases the lube fill. On our ’05 Dodge Ram 3500 11.5″ AAM axle, the fill was right at 5 quarts. This simplified the filling operation and gave use more capacity than stock. The added fluid provides more protection, and with this finned aluminum alloy cover, the lube will run even cooler. Royal Purple ‘Max Gear’ lowers friction, resists shear, reduces stress and normalizes temperatures. 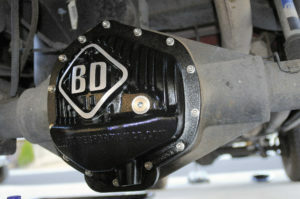 Combined with the BD Diesel Performance cover, we have the best protection possible. Tighten the plug snugly to assure a safe seal. 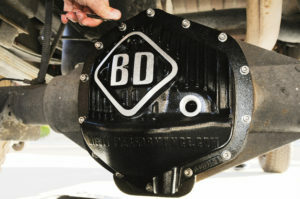 The fill check is easy with this BD Diesel Performance differential cover. The 9.25″ front cover has a similar plug provision and magnetic drain plug. 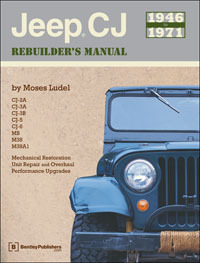 The front cover’s flange face is smooth and requires RTV sealant. 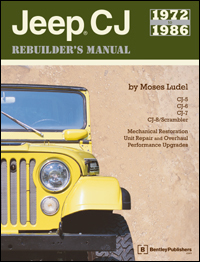 We use Loctite ‘Superflex’ Blue RTV on the front cover. 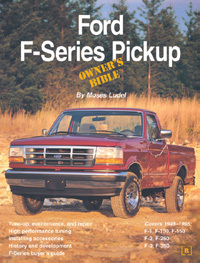 Attractive and tough, this cover is way more than cosmetic! With 4.56:1 axle gears, these covers provide the best protection of the gear set and bearings. 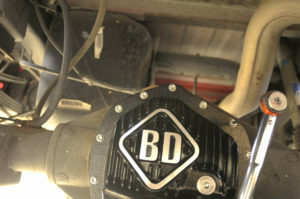 BD Diesel Performance has Ram and GM heavy duty 2500/3500 truck use in mind. Final torque should be rechecked after a drive of 30 miles or so. When installed, these screws were torqued then allowed to set for several minutes, then re-checked with the torque wrench. The follow-up torque re-checked showed minimal change, a sign that this cover and hardware take a reliable set! Note: Since the Royal Purple ‘Max Gear’ 75W-140 lube and BD Diesel Performance differential covers were installed simultaneously, credit for the improvements applies to the combined products. Before: 4.56:1 axle gears are notorious for increased noise. These aftermarket gears were set up precisely to reduce that liability, and the axles produce minimal noise. Minuscule “noise” only occurs at distinct harmonics: between 55-57 mph and 71-72 mph cruise in fourth/overdrive gear at light load. The noise does not denote any mechanical problems with the axle or differential. There has also been a barely detectable driveline (one-piece, long rear driveshaft) flutter during the transition from drive-to-deceleration. This phenomenon is nearly undetectable and does not reflect mechanical issues. This nearly imperceptible symptom has not changed since the break-in of the 4.56 gears nearly 80K miles ago, nor has changing drivelines made any difference. The ring-and-pinion tooth contact pattern is spot on. During installation, bearing preloads were set to specification for new bearings. This is 4.56 gear ratio phenomena with a 41 tooth ring gear (same as 3.73) and a 9-tooth pinion (OEM 3.73 uses 11-tooth). Below, above and between these road speeds/rpm points, there has been no detectable noise. The axles have performed very well overall. Worth noting, the noise was more pronounced as driving time increased, an indication that the Mopar® 75W-140 lubricant declined in performance with heat build-up. 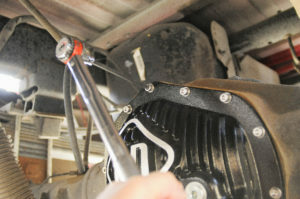 After installing the covers and changing to Royal Purple ‘Max Gear’ 75W-140 lube: Installing these BD Diesel Performance differential covers and filling the axles with Royal Purple ‘Max Gear’ 75W-140 lube dramatically reduced the subtle rpm related axle noise. 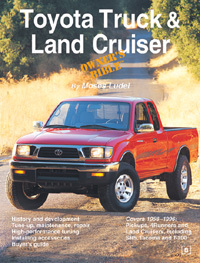 There is no additional noise when the rear axle (2WD mode) runs hotter under load. Now, the transition from drive-to-deceleration and back has no detectable transition signs. The reduction in harmonic, rpm related noise can be attributed to the pinion gear receiving much more oil, and that oil reaches the pinion shaft bearings for added protection. Royal Purple ‘Max Gear’ 75W-140 works exceptionally well, showing no sign of viscosity breakdown when the axle warms up or gets hotter. The combined improvement in lube flow, the cooling effect of the BD Diesel Performance finned aluminum alloy differential covers, the added lube capacity of these covers, and the superior lubrication and cooling impact of Royal Purple ‘Max Gear’ lubricant is evident. We expect longer lube change intervals determined by a visual inspection of the gear lube condition at the axle fill hole. 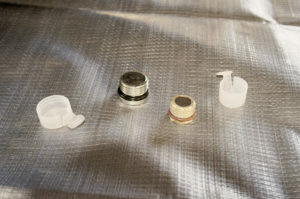 There will be less overall maintenance concerns with the magnetic drain plugs positioned at low points in the covers. The axles are better lubricated with superior protection from load impact and heat. In our case, this helps offset the inherent issues associated with 4.56:1 gearing (41/9 ring and pinion sets). 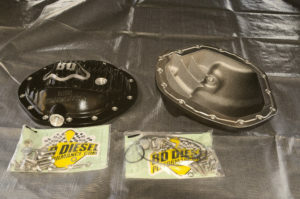 Our tests prove the utility and design superiority of these BD Diesel Performance differential covers for the AAM 11.5″ and 9.25″ axles. The value of Royal Purple ‘Max Gear’ 75W-140 for towing and heavy duty use is clear. This is our choice for a reliable, long service life from these axles!